Pago Pago (170.70W 14.272S), on the island of Tutuila, was the chief port of American Samoa, with a superb anchorage but construction of an airstrip very far from complete. The port is located 2276 miles (3663 km) southwest of Pearl Harbor and 2370 miles (3814 km) northeast of Sydney. The island of Tutuila is about 21 miles (34 km) long and up to six miles (10 km) wide, with Pago Pago Harbor, an eroded volcanic crater, cutting deeply into the south coast. The terrain is mostly heavily eroded mountains reaching to 2141' (1397 meters), although there is a flat coastal plain on the south coast. The island is heavily forested except where it is cultivated along the south coast. Copra was the chief export. The south coast has a fringing reef and a coastal road runs the length of the island. The climate is very wet, with some 190 inches (480 cm) of rainfall per year, mostly in November to February. Water shortages are possible during the dry summer. Tropical cyclones are infrequent but can raise the annual rainfall to 300 inches (760 cm). Temperatures reach 90F (32C) from December to February and dip to as low as 75F (24C) March to November. In 1940 the island had a population of some 10,00 natives and a handful of American administrators, of whom about 1000 lived in Pago Pago. The islands are free of malaria and most other tropical diseases, but some 3000 Marine and Navy personnel were infected with elephantiasis before the Marines were withdrawn in December 1943. Navy doctors were able to cure those afflicted by moving them to the cooler climate of Klamath, Oregon, but none were returned to tropical duty. 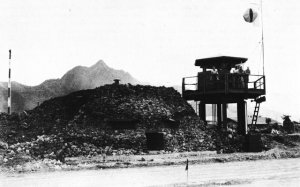 The U.S. Navy's first overseas base was opened here in 1892 and served as a coaling station during World War I. Thereafter the station commander also served as Naval Governor. Relations with the natives were generally good, since the Navy adopted a "Samoa for the Samoans" policy and generally respected local customs and tribal rule. However, in 1920 the naval governor alienated the Samoans so badly that most of the station officers sided with the Samoans. The commander committed suicide rather than face a Board of Inquiry. The harbor was defended by 7 Marine Defense Battalion, 1 Samoan Battalion, and minesweeper Kingfisher at the time war broke out in the Pacific. Because of its strategic location along the sea lanes from the U.S. West Coast to Australia, the island was reinforced very early in the war (Operation PICADOR). Fletcher's Task Force 17 (Yorktown) escorted a convoy out of San Diego on 6 January 1942 that included ammunition ship Lassen, fleet oiler Kaskaskia, transports Lurline, Monterey, and Matsonia, and cargo ship Jupiter carrying 4800 men of 2 Marine Brigade (Larsen). There was considerable concern that the Japanese might make a counter move, since security was dismal at San Diego; for example, numerous crates were stacked at the docks with "Supply Officer, Naval Station, Tutuila, Samoa" clearly visible. Distant support was provided by Halsey with Task Force 8 (Enterprise). However, the convoy arrived uneventfully on 20 January. Construction of the airstrip, at Tafune four miles (six km) south of Pago Pago on the southern coastal plain, was completed on 17 March. Marine Air Group 13 was then brought in to man the airfield. The runway eventually had one 3000' (910 meter) and one 6000' (1830 meter) runway. A third 6000' runway was completed late in 1942 at Leone, four miles west of Tafune.